Cabin Fervor: Grow baby grow! We had a pretty productive weekend around here. One of the biggest accomplishments was planting grass in the front yard! (Well, about two-thirds of the front yard... but let's not split hairs.) 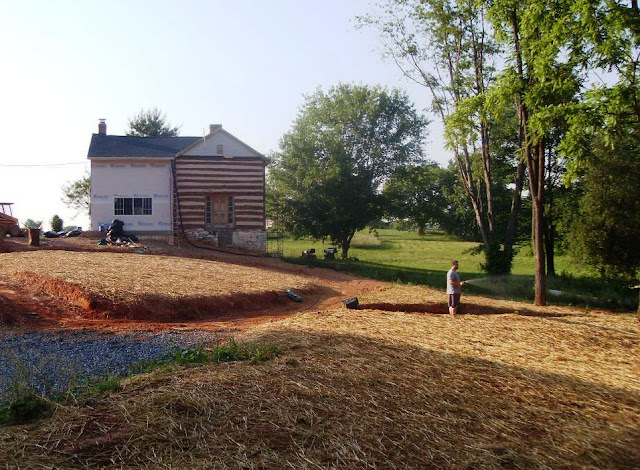 In addition to making the front yard look a million times better, planting grass is a requirement by the permit office because our property feeds into a tiny stream that feeds into the Chesapeake Bay. This is serious business, and implementing an erosion plan is critical. We are using Pennington Smart Seed (along with Pennington Lawn Starter Fertilizer) and hoping for some good, fast-growing results. It's been scorching hot, so we're being diligent about watering until it starts taking off. Our first attempt at planting grass a year and a half ago in our side yard went amazingly well, so we're hoping for repeat results this time around. As you can see below, we are almost finished carving out the new circular driveway. (There is still some finessing to do in some places, but it's progress.) We actually don't plan to have a whole front yard full of grass as a long-term solution -- in fact, we'd love to do some serious planting and landscaping in the next year or two so that there will be less mowing, more variety of plant life and more curb appeal. But like I said, we are required to implement an erosion plan ASAP, and grass is a much more affordable solution than other plants/trees at this point. I am so excited that in just a few weeks, when the kitchen framing is done, we will be ready for siding! Between that and grass, the front view of the house will really start looking like something. And once we paint the siding Crabby Apple Red (maybe this summer, maybe not), look out! I've really got an itch to get things done around the house, and the more we get done the more I feel motivated to keep going. I wish I had another day off to knock some things off the list! How about you? What did you do over the holiday weekend? You guys definitely take "nesting" to a whole new level! Linds, tell me about it! The sad thing is, there's lots of "nesting" going on, but none of it is actually baby related. I haven't bought a single thing for her yet, and I'm already in the 3rd trimester! I'm more concerned about having the washer/dryer hooked up right now (very key!) than having the nursery all ready, so I'm trying to remember the priorities and not worry too much about the details. But the urge to be all ready for her arrival is really strong, so it's taking some effort to maintain an even keel! Thanks Jenny!! He worked 20 days straight without a break? You guys definitely deserved some relaxation time. (We managed to fit some of that in too.) Thanks for the kind words--I'm really getting excited to see the house coming together, bit by bit. We did lots and lots of scrubbing and cleaning at the new house. can't wait to get in there and do some actual renovating! your house is looking great - can't wait to see your house with the siding!